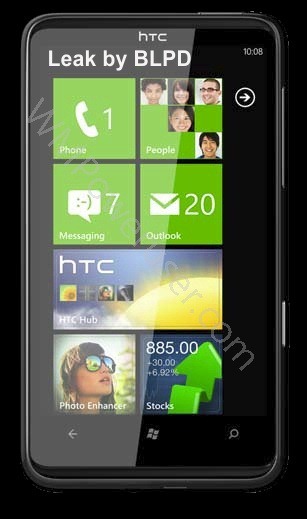 HTC’s new Windows Phone 7 handset, dubbed the HD7 (but labeled HD3 in these shots), has been outed in a Taiwanese forum. 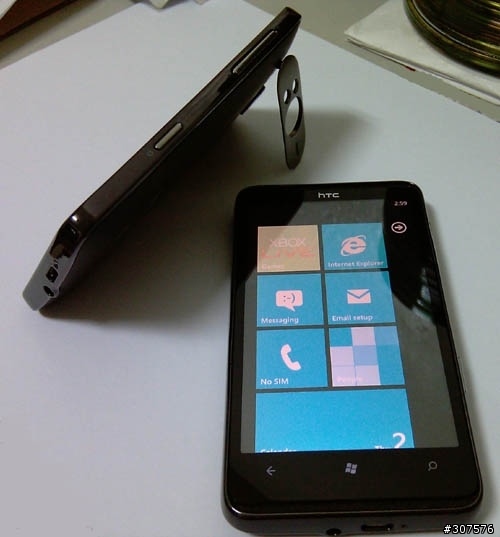 The successor to the Windows Mobile-powered HTC HD2 sports a very similar design and internals to its predecessor, with a large 4.3″ WVGA (800×480) touchscreen and the same 1 GHz Qualcomm Snapdragon QSD8250 CPU and MicroUSB and 3.5mm audio ports as earlier. The phone has 8GB of built-in storage (likely non-expandable), and the volume rocker has been moved to the right side. The camera is the same 5 MP unit from the HD2, with 720p video recording and dual-LED flash, but the phone gains a dedicated camera button on the side. 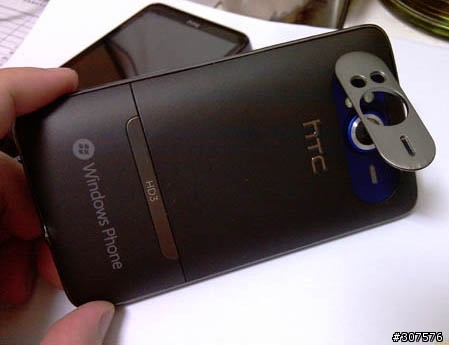 There’s now also a kickstand in the back, like the Android-powered HTC EVO 4G, but this time cleverly hidden in the camera bezel. There are grille slots at the top and bottom (whereas the HD2/EVO have just one at the top), suggesting the HD7 might be sporting stereo speakers. 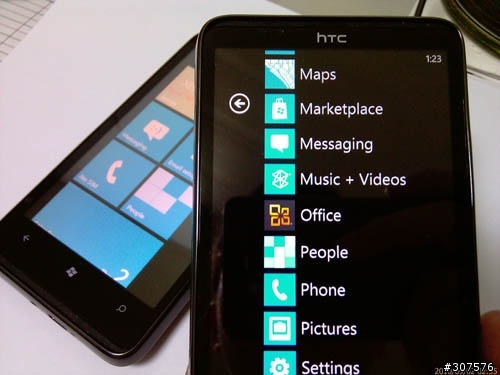 The HD2’s array of bottom buttons has been replaced by 3 capacitive touch keys (the standard Windows Phone 7 setup of back, start, and search). 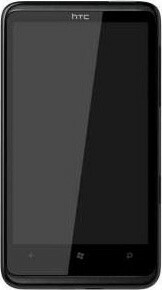 Otherwise the phone looks very similar to the HD2– we were surprised to see that the processor, while still speedy today, has not been upgraded, and the phone lacks a Mini-HDMI output and front camera (for video chat), both of which the EVO 4G has. 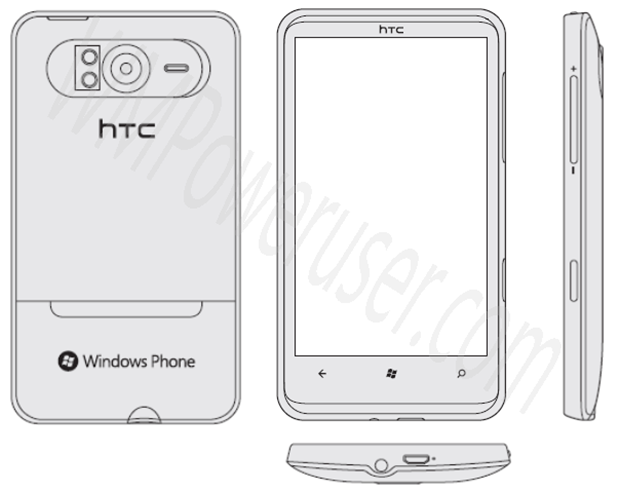 We suspect that’s because HTC simply went about upgrading the HD2 (we’ve seen the codename “HD2+” milling about carrier sheets) and didn’t bother with large chassis changes. This will be a GSM-only model and will hit T-Mobile USA this fall; AT&T may also get it at some point. No pricing or release date info yet.